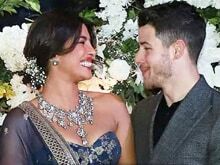 'Priyanka Chopra and Nick Jonas are engaged' - these seven words, seen on several international webloids, have provoked a seismic reaction in India. People Magazine and E!report that Priyanka said yes to Nick on her 36th birthday - July 18 - after having dated for a couple of months. This jhat mangni was hinted at in a gleeful tweet posted by filmmaker Ali Abbas Zafar today which revealed that Priyanka would no longer be starring opposite Salman Khan in new film Bharat.